So I will try to keep this as rant free as possible, but here is the warning that it may have slight indications of one. I love watching pageants, Miss USA, Miss America, you name it, I always have ever since I was a little girl, I guess it’s the girly-girl in me. I always loved seeing the beautiful gowns, the gorgeous hair-dos and make-up and watching the talent competition. Still to this day I like to watch as the finalists receive their last question and try to articulate an answer under immense pressure. Of course I offer my own critiquing of their answers and try to guess who will win the crown. This past Sunday I happened to catch the last 30 minutes or so of Miss USA, enough to see the finalists announced to the final crowning. One thing that struck me as they showed the remaining contestants was how all the women looked the same. The same hairstyle, same make-up, same cheek bones, same eyebrow shape, you name it and the list goes on. I realize these pageants have become more and more superficial over the years, don’t even get me started with the swimsuit competition, but it seems now individuality has also been swept under the rug. What concerns me is the kind of message this sends to young and not so young girls alike, the standard it sets and the false ideology of beauty it creates. It’s dangerous on many levels to directly or indirectly define beauty as an over all look to achieve. In trying to replicate an image personal identity is often lost for the sake of conformity. I am not judging any of the contestants, but I would love to see a pageant with real women. One girls could identify with, that showcases individuality and goes far beyond appearances. Each one of us has been uniquely created, set apart and given a specific purpose in our life. It’s in embracing the gift that joy is found and true beauty flourishes. I think that might be a rant maybe. Where did you find that photo? 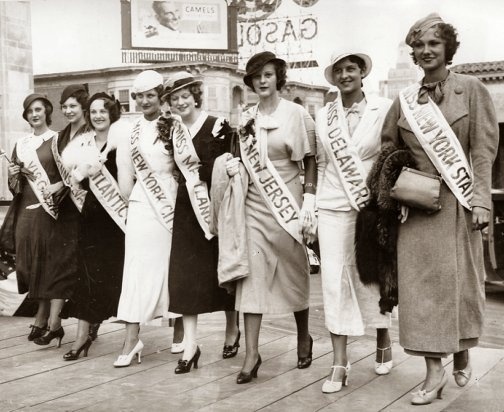 Incredible to think there was once a time when beauty pageant contestants dressed like that. I would love to see one of those pageants! I just did a search for vintage Miss America pageant photos. Me too, would be fun to watch! Agree! I absolutely LOVE watching them but you are right, over the years they all look the same. I like the differences in each girl. That’s what makes them stand out.